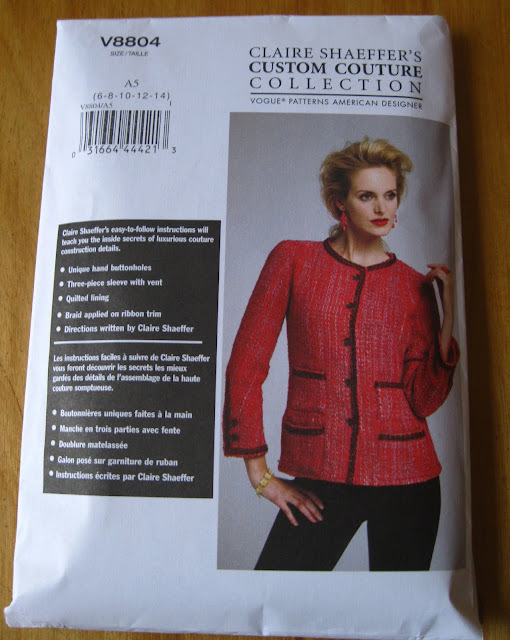 One of the main reasons I want to tackle the project of making a Chanel-like jacket is because Claire Shaeffer, who literally wrote the book on couture sewing techniques, designed the pattern and wrote the instructions for V8804. She is also penning a six-part series on sewing the jacket for Vogue Patterns. From reading her book Couture Sewing Techniques I know she is an expert in the technical secrets of haute couture and I’m hoping her articles in Vogue Patterns will be clear and in-depth so even relative sewing neophytes like myself can follow along. The addition of French makes me want to pretend I work in an haute couture atelier. Oui! Claire's opening paragraph. I love it. Her reassuring writing in the beginning of the pattern instructions bolsters my confidence. Which is good, because I look at the pattern with all the stitching lines for quilting various parts of the jacket and think I am in deep doo-doo. The lower half of the side front with the stitching lines to quilt the lining to the shell fabric. At this point I am gathering resources which will help me take on (and complete!) this jacket and number one in my arsenal is my mother, who has a lot of sewing experience, much more than myself, and whom I plan on consulting often. I also plan on being at her house in July and that’s when I am going to work on the muslin. I know I want my jacket semi-fitted, slightly tight, and with bracelet sleeves, so a muslin is a must to perfect the proportions and fit. Sewers talk about loving the three-piece sleeve in a Chanel jacket. I don’t know that I fully understand the significance of the three-piece sleeve, I’m assuming it’s about controlling the shape, but Claire’s pattern has one, which is another plus. I do know that Coco Chanel had very strong feelings about sleeves so I feel there is a whole world I am going to learn about. Part of the upper sleeve back. I'm scared. Hold me! Are you taking on a sewing project this summer? This is fascinating Jill...it will be fun to learn along with you! I've actuall decided to sew this jacket. I ordered the pattern during BMV's sale and it's on its way. All of my sewing projects are by hand...but inspired by your first post on the Chanel jacket, I thrifted something similar...but, it is a one piece sleeve. I'm highly interested in your project. Jill, I plan to put a blog up before the end of the month. I read the instructions last night in bed. Holy cats. I'm going to try it, too! I need a real painstaking project to focus on. It will be good to follow your progress. I wish I had time for a summer project, but between kids and my freelance work I know there's no way. If I did have time I would be making a maxi dress - one that actually hits the ground on my 5'9" frame! Good luck on your Chanel jacket. I taught sewing for a time and my advice is to definitely make the muslin first for fit but also so you can see how the pattern is put together. Take your time, be patient, and remember if you sew something incorrectly you can always rip it out. My chanel jacket project has been on ice for over 6 mmonths now because I'm terrified that my fit won't be good evn though I did extensive muslin fittings. Now that I also have this pattern I'm also thinking that I should ditch the one I already fit and try this one. I notice that you are in brooklyn. Moi aussi. Perhaps we could arrange a little fitting session with our muslins? I am planning to make this jacket too, so I've been reading the blogs. Over and over people longingly refer to a "real" Chanel jacket, and I have to wonder why. Coco Chanel died 40 years ago, so why is a jacket designed by Karl Lagerfeld and sewn by an anonymous French seamstress any more real than one designed by Claire Shaeffer and sewn by an American home sewer? We can get the same fabrics, trims, even buttons, and what some of us may lack in professional sewing skills can be made up for with slow, meticulous attention to detail that matches anything from the atelier. Only pre-1971 vintage Chanel will be more "real" than your jacket. I am making my own pattern for a mini version of a Chanel jacket for a kids design competition called project Run and play that airs on a blog of the same name. I am so happy there is a pattern with sewing directions although I don't need the pattern. Actually I think I will make one for myself too! Great intro to the pattern! I'm getting ready to do my fit sample for this one. I took a 2-day class from Claire in September where we made one sleeve. :) I've used Susan Kahlje's method before, so looking forward to trying Claire's way.